A decorated upright slab used in classical architecture and derivatives to close or conceal the open end of a row of tiles which cover the joints of roof tiles. A similar ornament on the ridge of a roof. 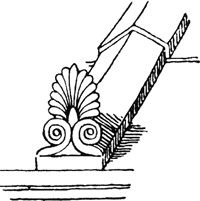 A decorated upright slab used in classical architecture and other derivatives to close or conceal the open end of a row of tiles that covers the joints of roof tiles. 1. A decorated upright slab used in classical architecture and derivatives to close or conceal the open end of a row of tiles which cover the joints of roof tiles. 2. A similar ornament on the ridge of a roof.